July 8, 2010  Free agent LeBron James will tell the world where he intends to play basketball next season. 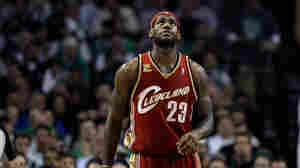 If he sticks with the Cleveland Cavaliers his chances of winning a championship anytime soon are minimal. Regardless of his decision, his star will be diminished. Seeing Red: Don't Show Me Your Card! 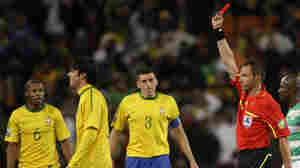 June 21, 2010  Red and yellow cards are fouling up an already colorful sport. July 8, 2009  The Wall Street Journal notes a spike in runners qualifying for the Boston Marathon. May 21, 2009  The recession has blown up retirement plans around the country. Older working Americans — those between 55 and 64 — are seeing their nest eggs wither at exactly the moment they can least afford that to happen. As a result many are looking to return to the work force. Hunkering Down In Recession: A Return To Thrift? March 11, 2009  Americans need to save more. They also need to spend more because no recovery can take place with consumers on the sidelines. That's the nub of one of the many challenges facing the battered, reeling economy. February 10, 2009  Treasury Secretary Timothy Geithner outlined the administration's new financial bailout plan on Tuesday. Here, a look at how the government plans to restore the flow of credit, improve loans to consumers and businesses and wean banks off public financial assistance. Why Are Oil Prices Sinking So Quickly? October 22, 2008  Oil prices are down to about $66 a barrel, a huge decrease from the all-time high of $147 in July. Consumption is down globally. People are driving less and the economic meltdown has resulted in factories producing less as well.